Perfect voiture for Paris, at least its size. This photo reminds us of how the term 'trunk' was applied to automobiles. It warmed today here in Minneapolis, actually more like Paris weather (45 F or 7 C) and still only a dusting of snow on the ground. Very strange weather for you and for us. WOW! That car is in "mint condition" as they say in the US. Love the vintage colour too. Omg I used to love these cars! So elegant! What a great little street scene and car! Maybe they're off for a warm European holiday in the south of France! I love the "Bambino" cars! I love there old 500!! OH so cute ! I would love to have such a car. Thib, did your uncle go by the name of Monsieur Hulot by any chance? with the camera hanging out the window..
and give us the best shots of Paris...Qui?? Back in the 80's when I first visited Paris, one of the scenes that stayed with me as archetypal Paris was early one morning a 500 Abarth being driven enthusiastically as it should be by a lady in what I guessed was sixties or seventies. I have no doubt she would have been one of the few lady racing drivers in the 1930s. The car and Paris are together in my mind for ever. I would love one of those cars!! This is just adorable. Can't you see a picnic lunch being strapped into that case? So fun. ooh I love that pic Eric! Maybe Michael is wishing for another trip to the country in one of these! Michael! Tu es Francais maintenant? Congratulations! I love them too. I stopped in the middle of the street and snapped one heading straight for me. It was blurry! Damn. Love them too...and have for many years!! Merci!! They have introduced a new similar model for the American market to compete with the Mini-Cooper by BMW!! Gotta get those dollars while ya can!! LOL!! 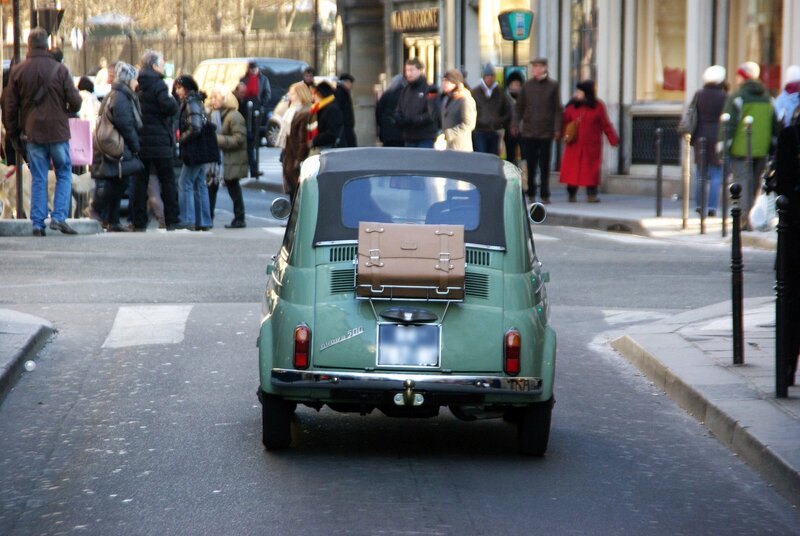 That is a jewel of a Fiat 500, love the trunk! In the Portland Oregon franchise store for the cinquecento the salesman told me in November 2011 that the pea-soup green color was his most popular. I was eager to like the Fiat 500 but it had no power so I have crossed it off my list. Soooo cute! I want one. : ) Thib, I love your story - what an image. And, Michael, congratulations! What a wonderful event. I checked into the possiblity of German citizenship this year, as I was born there, but it seems I needed at least one German parent in order to qualify. Oh, well...nice dream while it lasted! @Jeff 45 F? Gee, do you have your swim suit ready?! @Michael "Maybe they're off for a warm European holiday in the south of France!" Not Italy anyway, as apparently Rome is buried in snow! @Ham (hi!) "a 500 Abarth " Ahhhhh a 500 Abarth! @tonton "hey have introduced a new similar model for the American market to compete with the Mini-Cooper by BMW!" Yes, but they are "real cars" now, not at all like the toy old ones (and that is whay they are expensive). When we went on holiday to Tenerife in 1997, we had one of those Fiat 500's to drive. Getting it up and over Mount Teide was an experience, I can tell you. The poor little thing was almost dead by the time got up near the car park for the lifts! It was also pretty scary driving along the cliff roads too. Never broke down though. Great fun. Maybe they're time traveling! It's a great capture, Eric. Michael -- Congrats to you—and to France for getting you! I love these small compact cars. Would you believe that we have the Smart Car here in the States?People want to drive big cars because they feel safe. It is my dream to have a mini cooper. Love your blog! In Austria a similar exists - Puch 500.